My first full day in Quebec City with my Aunt Georgann started with a solo trip to the bakery for some fresh, French pastries (any frequent reader of this blog knows of my intense obsession with authentic French pastries…). It was so lovely walking through town as it was coming alive for the day! 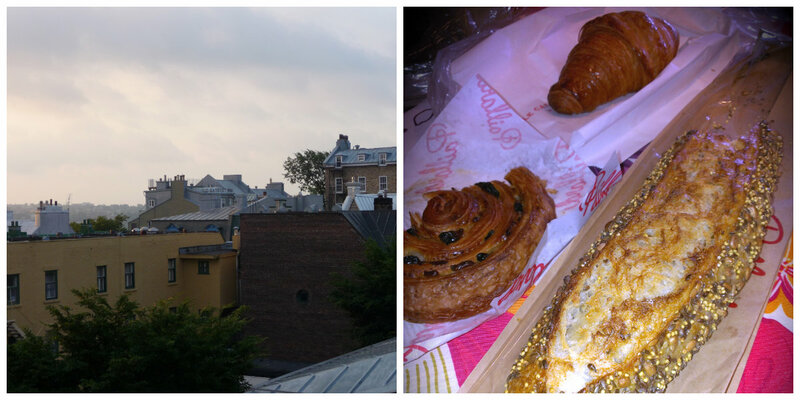 I had heard of Paillard, a cafe-boulangerie, during my researches of Quebec so I headed there and left with a whole grain baguette, a croissant, and a raisin danish. Georgann and I enjoyed those items, along with some fresh fruit and cheese, for breakfast. Yummy!! We didn’t really have an agenda for the day (other than the fresh pastries – that was most definitely on the agenda! ), so after breakfast we just wandered around town for a bit. We eventually found ourselves at the Parliament Building and decided to join one of the free tours. Since we had arrived quite a bit early for the next tour, we walked across the street to check out Battlefields Park. This is where many of the Music Festival concerts take place – more importantly, the concerts that we could hear each night from our apartment. 🙂 Because the festival was going on, the park was filled with barricades, vendor kiosks, security guards, etc. It definitely didn’t create the most attractive outdoor space I’ve ever visited and we didn’t hang around for very long. Back to the Parliament Building where the next English-speaking tour was getting ready to commence. We joined quite a few other people and explored many rooms of the building and learned of its history, as well as interesting facts regarding Canadian history, government and parliament. The Legislative Council Chamber and the National Assembly Chamber were both quite ornate and date back to the 1800s. Next stop was the Notre Dame Basilica. We had made a quick trip inside earlier in the morning and found out they also provide free guided tours throughout the day. We returned in time for an English tour and it just so happened that no one else showed up so we had our own private tour! Our tour guide was a young student from Seskachewan who was in Quebec for the summer on a mission trip. She shared quite a bit of the Basilica’s history and also informed us that this is the year of the jubilee, which means the Basilica’s Holy Door is open for pilgrims to pass through. The Notre Dame Basilica of Quebec contains one of only seven Holy Doors in the world and the only one located outside of Europe. It will close at the end of the year and not open again for twenty-five years. I had never heard of a Holy Door before and the Basilica’s website describes it as: A visual symbol of internal renewal, which begins with the willing desire to make peace with God, reconcile with your neighbors, restore in yourself everything that has been damaged in the past, and reshape your heart through conversion. Although I’m not Catholic, I still joined Georgann in walking through the Holy Door, and we both paused just inside the chapel to pray and contemplate. That evening we dined at D’Orsay Restaurant & Pub which had been recommended to us by our Airbnb hostess. What a fantastic meal! We sat at a table by the open window which provided us with natural air conditioning as well as a lovely view of the square in front of the Basilica. 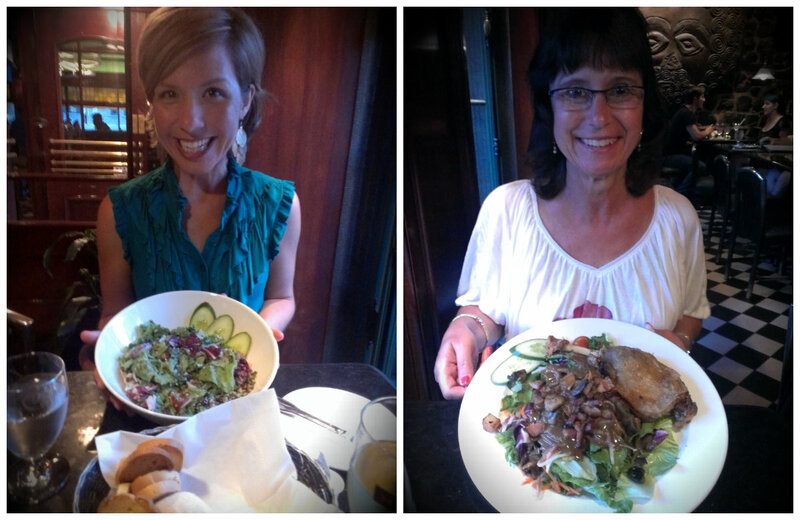 Georgann ordered the duck leg confit which she declared was the best dish she had had up to that point of our trip. I ordered the D’Orsay Salad which was, quite frankly, one of the most fantastic salads I’ve ever eaten. We were both very happy diners! 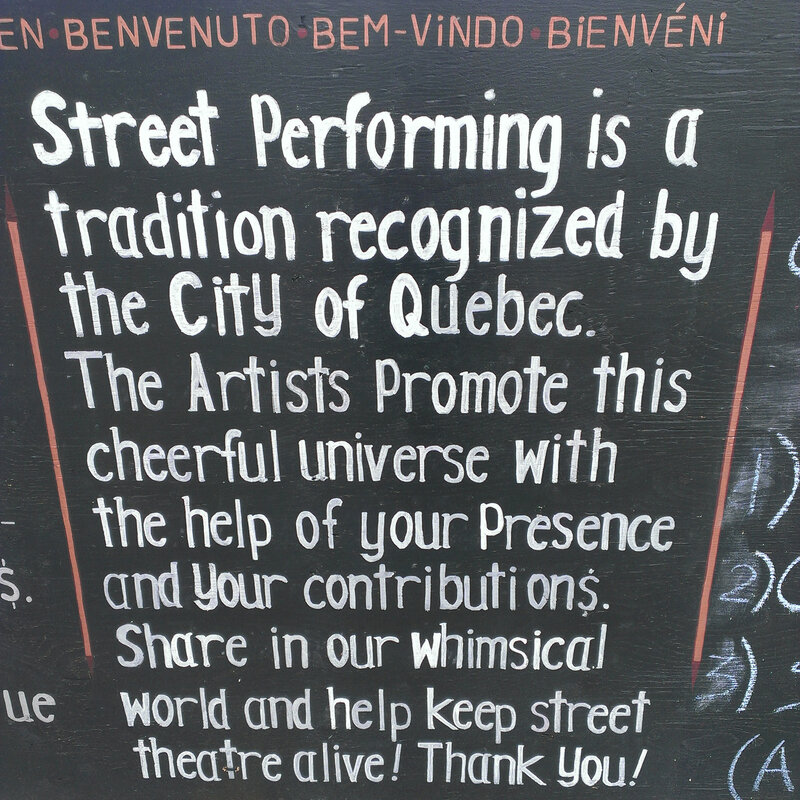 One of the things I love about the city of Quebec is how they encourage people to share their talents and art with the rest of the city by providing public spaces for them to perform in. Cirque du Soleil actually began in Quebec City – the idea born from street performers! Below is a sign located in one of the squares in Quebec. As Georgann and I were eating dinner, we could see the crowds gathering around the square across the street and could hear the cheers throughout our meal. So when we were finished, we wandered over to see what was going on. A street performer was just finishing up her routine and another one was waiting on the sidelines to take her place. We decided to find a seat and enjoy the next show. I don’t remember his name, but the performer we watched spent about thirty minutes or so luring people walking by to come have a seat and stay for his performance. He would pique their interest by walking along the sidewalk blowing fire. It was pretty impressive and he was pretty funny. 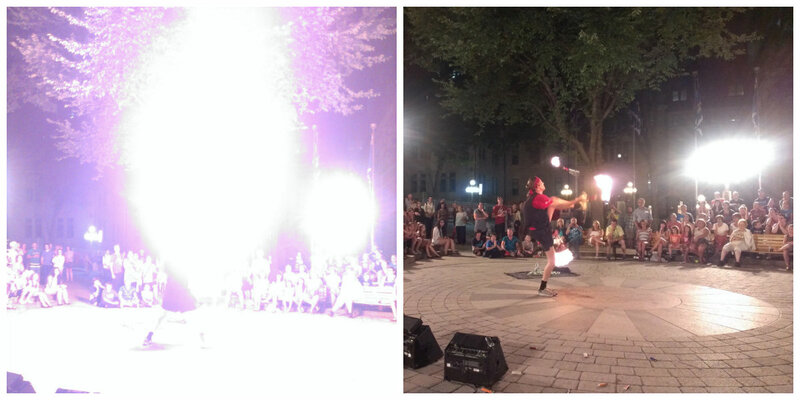 He also did quite a few juggling tricks – many involving fire. Unfortunately, his show was cut short due to an approaching rainstorm, but we still enjoyed the bit that we saw. 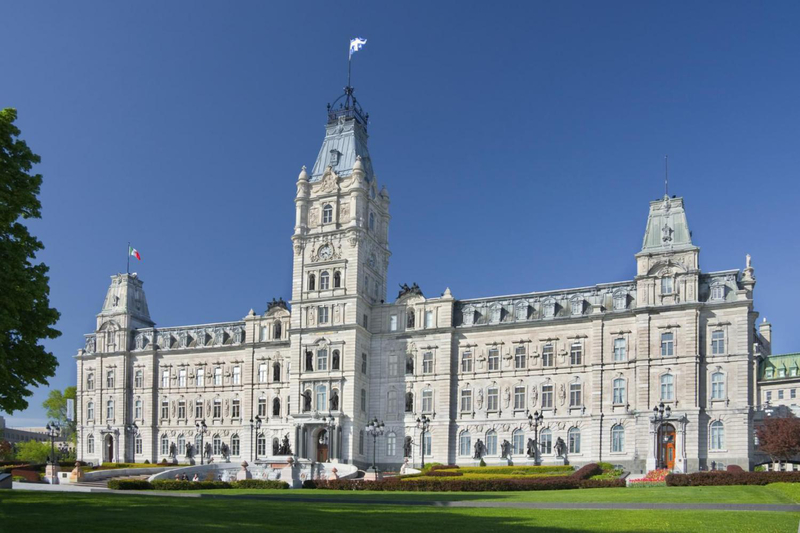 The Quebec Parliament Building offers free, daily 30-minute tours in both English and French. They run continuously throughout the year, Monday-Friday excluding holidays. I love history so I really enjoyed hearing about how the government/parliament came to be in this country and how it’s run. 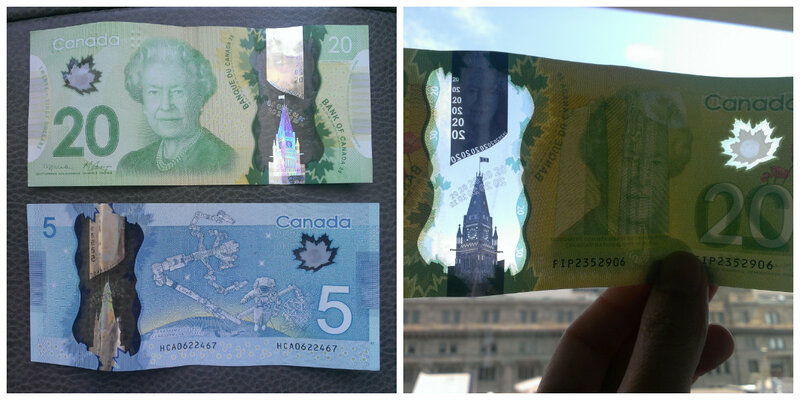 The Notre Dame Basilica also provides free daily tours in both English and French. The tour times are listed on a board inside near the entrance to the Basilica. Entrance is free and includes passage through the Holy Door which will remain open until December 28th of this year.